UNITED KINGDOM – November 8th 2013 – Terracotta is not a new concept and has been used by people thousands of years ago all across the ancient and medieval world. It is now one of the Green Building concepts that are being adopted by many architects, contractors, building companies and homeowners too. The best thing about terracotta tiles is that the manufacturing process is still carried out in the most conventional manner which is environment friendly too. Living Terracotta is one such company in the UK which supplies high quality handmade terracotta tiles and various types of terracotta floor tiles to customers across UK and Ireland. Apart from the traditional terracotta tiles, customers can also find tiles in different colors such as Chocolate, Cream, Grey and Black so that they can customize their flooring according to the interiors or exteriors of their homes. The best thing about terracotta is that they contribute to a beautiful, pleasant, healthy and a contemporary atmosphere. As terracotta tiles are porous, they need to be sealed with the help of sealants. The handmade terracotta tiles and the machine terracotta tiles can be installed with the help of the installation guide provided here along with tips to clean the terracotta tiles and maintenance of the same. Only the highest quality terracotta tiles are supplied by this company. These tiles are used not only in conservation projects but also various conservatories, pubs, restaurants, kitchen floors, hallways, barn conversions, etc. The company offers a range of tiles that suit various requirements and situations of the customers. Terracotta tiles for both internal and external purposes along with frostproof tiles are available here. “By using our manufacturers and our UK stockholding, we are revolutionising the British Terracotta tile market. Our mantra is to offer customers ‘best quality, best value and best service’”, says David Hurst, Sales and Marketing Director, Living Terracotta. 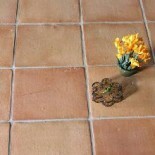 Living Terracotta, www.livingterracotta.com based in the United Kingdom is a dealer and supplier of terracotta tiles. The company was established by David Hurst in 2005. It is now one of the major suppliers of terracotta tiles within the UK and Ireland markets. The company manufactures and supplies their products to Architects, Private Customers, Design Companies, etc. This entry was posted on November 8, 2013 by Living Terracotta in General info and tagged antique tiles, black clay tiles, black terracotta, clay tiles, farmhouse floors, grouting, handmade terracotta, handmade terracotta tiles, how to lay terracotta, How To Seal Terracotta, terracotta on concrete, Terracotta tiles, terracotta wall tiles.